The No More Heroes developer and other industry legends sign on to develop Social Networking games for Mobage. 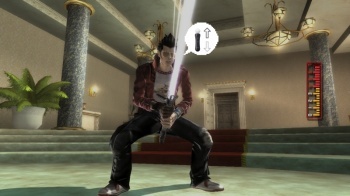 DeNA, operator of Japan's premier social gaming network, has signed up the Killer7 and No More Heroes director, Suda 51, to create a new No More Heroes game for social gaming network, Mobage, as part of its "Super Creators initiative." Megaman co-creator Keiji Inafune, Sonic and Nights creator Yuji Naka, Yoshifumi Hashimoto of Harvest Moon fame and Noritaka Funamizu whose production credits cover pretty much every good Capcom game ever, were also name dropped as developing games for the service. That's a lot of talent right there. While details about the games were vague, DeNA did reveal that Inafune will be developing an "action game" called J.J Rockets and Yoshifumi will be working on a new Harvest Moon title. Honestly, the idea of Harvest Moon crossed with the Skinner box addictiveness of a Farmville-like system is terrifying in its sheer money grabbing potential. The money is certainly there to be made. Mobage (formerly Mobage-town), a kind of cross between Facebook and Habbo Hotel exclusive to mobile phones, has been utterly dominating Japan for the past half a decade. Though its 11 million users may seem paltry in comparison to Facebook's 750 million, DeNA is quick to point out that the service generates as much as thirty times more revenue per user than Facebook and 15 times that of Zynga users. DeNA didn't mention if or when these titles would see a release on Mobage's international counterpart, Mobage Worldwide, which is supposed to launch sometime this month.